Another SQL Blog - Jason Yousef: SSRS can be also used for user inputs! SSRS can be also used for user inputs! A recent question popped up and the discussion heated up regarding updating a COMMENTS (TXT) field in a table using SSRS. 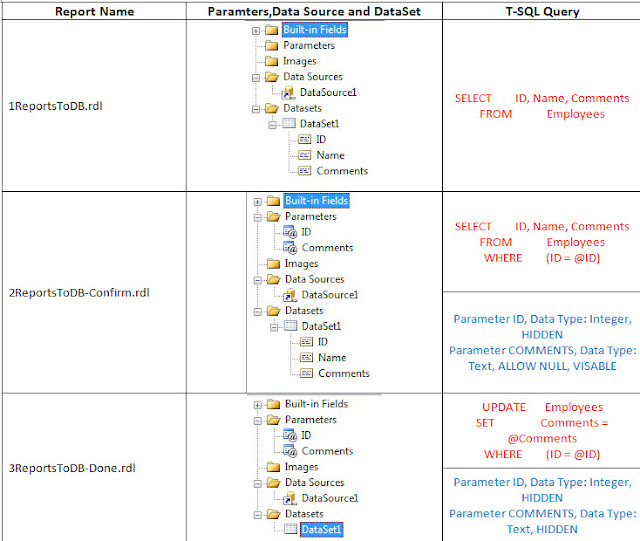 Of course it’s not the best way to use SSRS as it’s a presentation layer and so limited in doing that using Parameters and sub-Reports which will fire a code or a stored procedure to update or delete a record…but IT COULD BE DONE!! 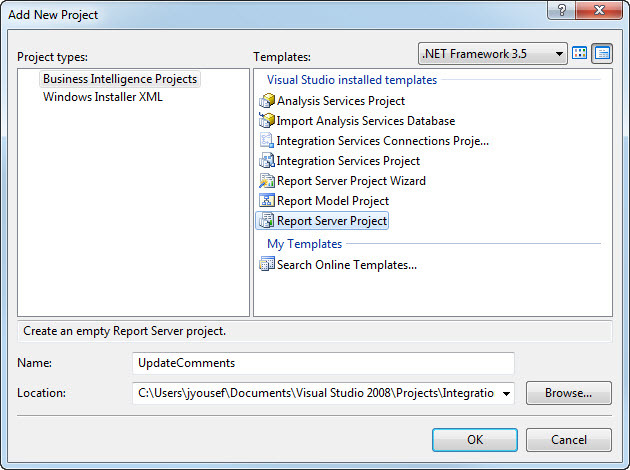 1-I started by creating a new project in VS 2008, “Report Server Project” type. 3-I created a test table called “Employees” contains only 3 columns. 6-created 3 Blank reports, using the shared Data Source. 1- To display the records which in the table. 2- A user summary and confirm screen of which record will be updated and with what. 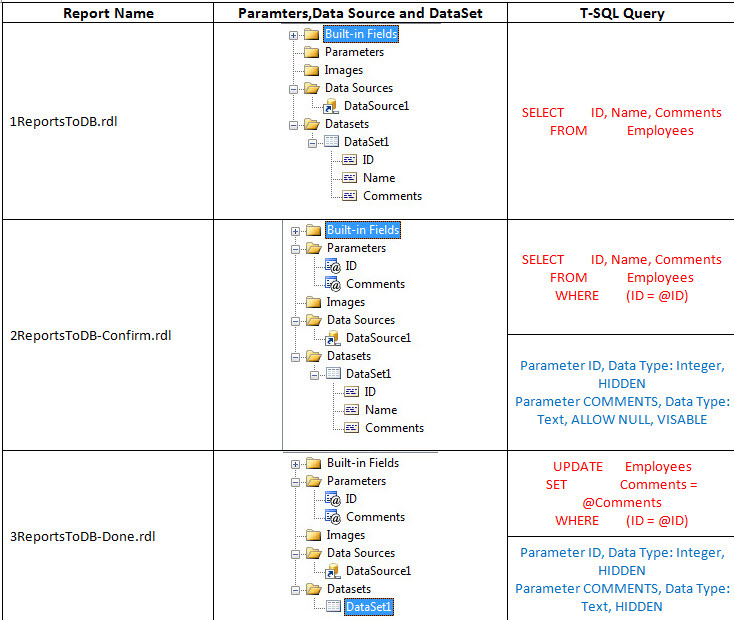 3- A done screen, which will call a stored procedure or just have a simple inline T-SQL query. That’s the trick in the second report, you need to hide the ID and keep the Comments Parameter visible and allow it to accept NULL Value, so it display the record before you need to enter the value. And also if you need an empty comment, such as to clear the comments field or whatever. Just a basic table, drag the 3 fields to the table, added an extra field with an expression of =CHR(0254) and Font of: Wingdings Just to display a shape without using an image. 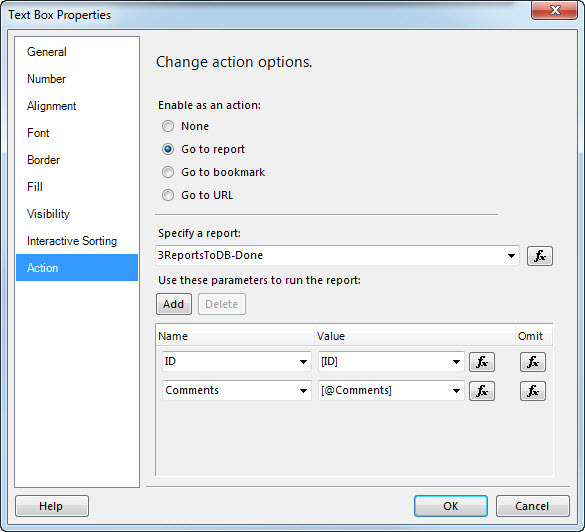 Also I added an action to that text field to go to report 2 and pass the ID. Again a simple table with the basic 3 fields and added another field for the new Comments value which is using an expression of: =Parameters!Comments.Value and a field for a confirmation symbol, yes again using my favorite shapes font WINGDINGS , with action to run the 3rd report and pass the ID and the new comments. I added 3 text fields, but it’s all optional (for fun). Just with an action to go back to the first report and the summary or what was done!! Lets’ run and test it…. That’s what you get at first because we allowed the NULL, that’s the trick to see the table before the parameter gets initialized. Remove the NULL check mark and enter the new comments…. And that’s what you get..
I’ll click on my GO Back, to the first report to check the data. Done.. my record was updated in the DB. 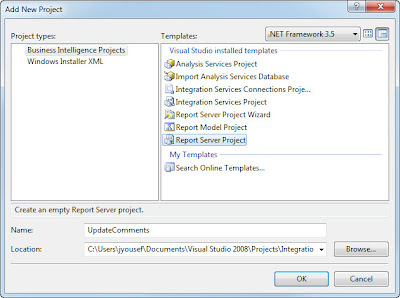 Again that’s for the purpose of showing that SSRS is more than a presentation layer and that was the simplest part, it could get more complicated and done more professionally using Custom .NET code and functions. Thanks, although it sounds crazy !